English: Wallace's standardwing; French: Paradisier de Wallace; German: Banderparadeisvogel; Spanish: Ave del Paraíso de Wallace. 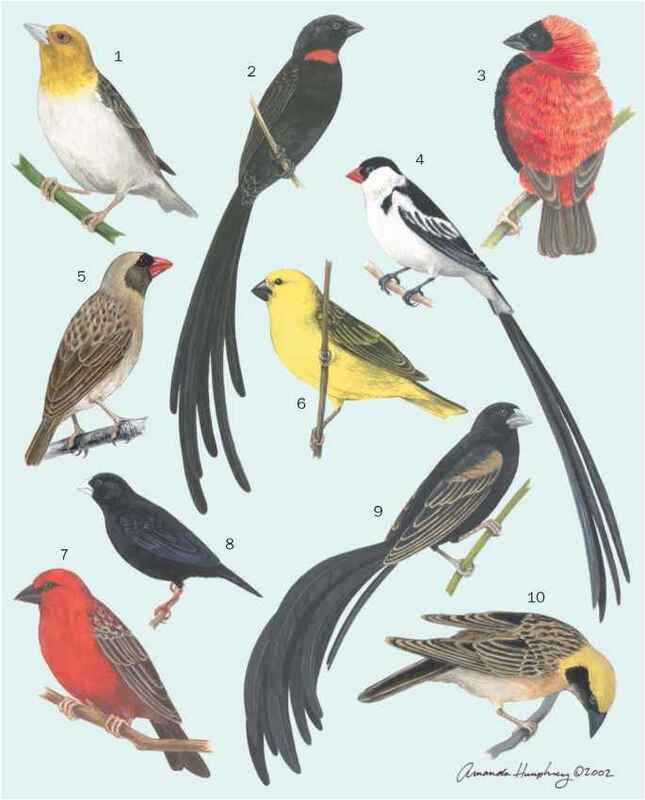 9.1-10.2 in (23-26 cm), but 11 in (28 cm) if the standards of adult males be included; female 0.28-0.32 lb (126-143 g), male 0.34-0.38 lb (152-174 g). Light brown head, upperparts, and central tail feathers. Decurved bill and tuft at base of mandible give both sexes a distinctive profile. Chin and upper throat brown, with highly iridescent greenish yellow breast shield. Two white, elongated lesser coverts are often longer than the wing. Legs orange; bill ivory-beige. The northern Moluccan Islands of Indonesia. 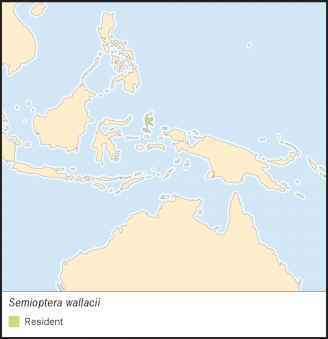 5. w. wallacii: Bacan Island, from low hills up to 3,770 ft (1,150 m) altitude, as probably also the population on Kasiruta Island; 5. w. halmaherae: Halmahera Island, from lower hills at about 820 ft (250 m) to about 3,300 ft (1,000 m) altitude. Polygynous, with densely lekking promiscuous adult males forming aggregations of 30-40 or more at traditional display trees. Breeding during at least May through September. Presumed exclusively female nest attendance. The only nest described was an open cup that included dry leaves and was 33 ft (10 m) above ground; it contained one egg.